Shobha Ingrown Relief Lotion - Special Discount for GlamMan Readers. 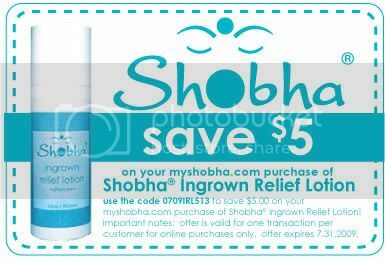 Shobha Ingrown Relief Lotion is a sensitive and effective one-step solution for the prevention and treatment of bumps and ingrown hairs caused by hair removal — usually sugaring or waxing. But here's a secret: it's also and excellent after-shave lotion for the face — one of the BEST that I've tried. Smooth and soothing and not oily at all. There's even better news... for a limited time, GlamMan readers are being offered a discount of $5.00 off an online purchase of Shobha Ingrown Relief Lotion. • valid for online purchases only. • offer expires at 12am EST 8/8/09. • Free of parabens, color and artificial fragrance. • For daily use: use immediately after shaving to moisturize the skin while soothing irritation and razor burn; begin using 48 hours after waxing/sugaring to prevent and treat ingrown hairs. • The 2-ounce size is TSA-friendly, making it the perfect travel companion to ensure smooth skin when lounging in paradise! This special promotion is being extended through August 7th.